These downdraft kiln vents weigh 10 lbs. The patented Orton Vent Master not only vents fumes but also improves firing results. The Orton VentMaster removes fumes containing volatile metals, fluorides and sulphur oxides. You can fire even lusters, decals, metallics, and pate-de-verre glass without strong odor. The flow of fresh air helps even out the temperature throughout the kiln. The downdraft kiln vents extend the life of the Kiln Sitter tube assembly, since fumes by-pass the tube. You will enjoy the convenience of the Vent Master. Throughout the firing, keep the lid closed and peephole plugs inserted. You no longer need to remember to lower the hot lid from vented position. The Vent Master increases firing time by about five minutes for firings up to cone 4; 12 minutes for firings from cone 4 to 10. It has little effect on maximum temperature. At 132 watts, electrical consumption of the motor on the downdraft kiln vent is only pennies per firing. 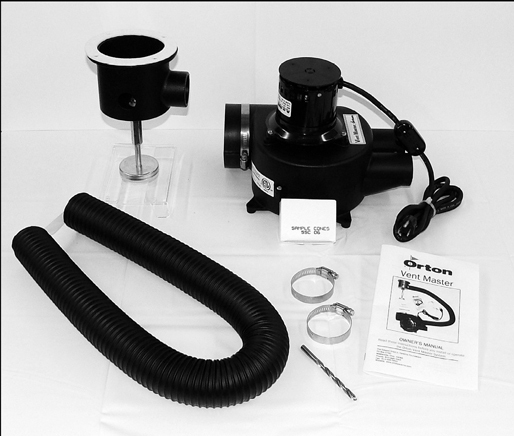 All Orton VentMasters include the main motor & blower housing, one four foot high-temperature hose, one collector cup, multiple hose clamps, installation instructions and sample cones for test firing. 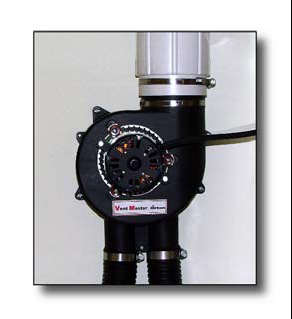 VentMaster Motor can be kept on the floor or mounted to the wall. If placement under kiln is obstructed, the collector cup can also be attached to the side of the kiln. With downdraft kiln vents, the kiln is kept under a slight negative pressure. Gases are pulled out of the kiln near the bottom, mixed with fresh room air and exhausted to the outside through a duct. Improved air flow in the kiln results in more uniform temperatures, reducing hot and cold spots. Downdraft kiln vents can also extend the life of the metallic parts of your kiln by removing corrosive fumes. This means longer kiln life and reduced repair costs.